Overall, OmniPlan is a good looking, intuitive and very well organized project management software for Mac which makes it easy to keep track of your projects and plans. It’s amazing the effectiveness a project management app can have on your productivity and ability to organize yourself efficiently. Once mastered, OmniPlan is an incredibly useful project management software for Mac and a superb replacement for Microsoft Project which doesn’t exist on Mac. OmniPlan can make a huge difference to how quickly and cost effectively you get jobs done whether you’re a freelancer, small business or management professional. What’s even better is that it’s designed specifically for Mac so it embraces all the aesthetics and advantages that Macs offer when it comes to being organized. Without further ado, let’s take a closer look at exactly what OmniPlan can do for you and your business. It’s inevitable that when juggling several assignments or projects at once, eventually you’ll drop the ball on one of them. OmniPlan helps prevent this by making it much easier to keep on top of everything you’re working on and does the organizational work for you. The developer of OmniPlan – Omni Group – has an excellent track record on Mac with OmniGraffle – a popular alternative to Visio for Mac. Omni Group also created the excellent OmniFocus and OmniOutliner and OmniPlan is definitely cut from the same quality cloth as the rest of its productivity apps. The other good thing about Omni Group is that they only make software for macOS or iOS – they don’t make Windows software and then try to palm-off an inferior version to Mac users. If therefore you’ve recently switched to Mac and are looking for a serious alternative to MS Project, don’t expect something similar. If however you like your apps tailored for Mac, you’re in for a treat in the way Omni Group approach Getting Things Done. OmniPlan’s biggest strengths are the way it helps you easily visualize projects and collaborate on them with colleagues in real time. 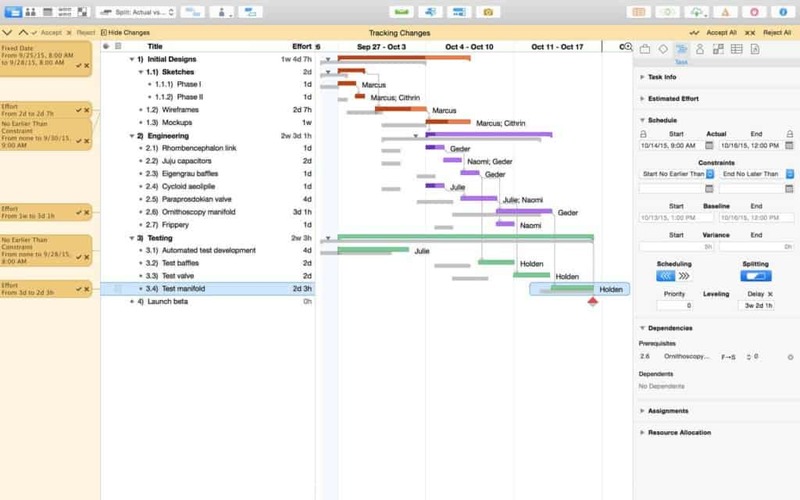 OmniPlan for Mac uses a Gantt Chart view to display whatever is going on in your project with a clear overviews of start times and task duration. The presentation of project details and status is informative and easy to navigate without being overwhelming, allowing you to drill down specific “nodes” for more detail. Nodes have different attributes but arguably the most important for a PM is “Effort”. Effort is converted into bars on the Gantt chart once OmniPlan knows how much people working on a project are being paid per hour. OmniPlan includes all the features you would expect from a professional Project Management software including Gantt charts, milestones, change tracking and summaries all topped-off in a slick macOS style interface. In other words, OmniPlan is like a super-charged To-Do List on steroids that looks good and doesn’t overwhelm you with detail. The Gantt chart overview is one of our favorite aspects to OmniPlan as it allows you to click and drag projects around as you need and as forecasts/completion times change. We also like the option to export Gantt charts and business plans in PDF or HTML format and send them to other colleagues or users that don’t have OmniPlan. Projects also snap together in much the way you edit video or audio in iMovie or in GarageBand. Real Time collaboration with OmniPlan is one of its strongest features. Any changes that are made to a project by anyone working on a project are synced immediately and you can see instantly in the left hand column whether colleagues are available or not. Assigning projects or “resources” is easy – you can drag and drop colleagues onto different projects and click on their name to see which projects they’re currently working on. The smart thing is, OmniPlan automatically calculates how much time is remaining on a project depending on how many resources you drag onto it. So for example, the more resources that are working on a project, the more OmniPlan automatically reduces project bars to reflect the shorter completion time. OmniPlan also includes Change Tracking – similar to the way Microsoft Word tracks changes – which allows you to see exactly the type of revisions have made to a project. OmniPlan can also open, edit and export Microsoft Project files although the reliability of this is a bit hit and miss. Support includes MPP, XML and MPX file formats but sometimes data will be exported or imported incorrectly, particularly if your MS Project files are detailed or complex. But if you just want to give a Windows user a general overview of your project without constantly importing and exporting data, it does the job fine. Note that the latest official version of OmniPlan supports importing files from MS Project 2003 to 2016. Other than Microsoft Project files, OmniPlan also exports to HTML for web publishing and can also be imported into Omni Group’s Productivity Tool OmniOutliner and diagram software OmniGraffle. OmniPlan has been designed specifically for Mac and the result of this is a minimal, clean interface which looks good in macOS. You can start off with the interface in “Simple” mode to keep things straightforward and then gradually customize it with more tools as you require them. This definitely helps you get started quickly without spending lots of time searching for the right tools to use. Creating Tasks and Resources is straightforward as is changing the position of different tasks and components. Plus you can attach documents, emails and files to project sections. You can drag and drop different project stages and all others that are affected will update themselves automatically. The useful thing is that OmniPlan gives you a clear overview of what task are still necessary in order to complete a project and how that will be affected – especially on critical paths – if other stages are changed or rescheduled. If you like to use iCal to keep track of completion dates and deadlines, OmniPlan also integrates with it. There’s also a handy time conflict checker which can spot or highlight where projects overlap or if there’s some kind of scheduling clash of any kind. You can also create your own templates in OmniPlan if you have frequent projects or assignment types that you complete on a regular basis. OmniPlan for iPad is also available from the Mac App Store which allows you to edit projects on the move and sync it with OmniPlan for Mac which is useful if employees or collaborators are offsite. You can synchronize OmniPlan with Omni Group’s OmniSync Server or iCloud if you prefer. Note however that you must pay an extra $40 in the iPad version in order to open Microsoft Project files in it and there’s no way to export to Microsoft Project. In general, the iPad version is not quite as intuitive to use as the Mac version considering that for including MS Project import support, it costs almost $100. There aren’t many downsides to OmniPlan but reporting is one area that’s quite limited. The aforementioned Microsoft Project import issues can also be a bit frustrating but with a little manual tidying and adjustment, it’s no major problem. We’ve also heard about sporadic issues with stability in OmniPlan although we never experienced any problems and this seems more of a problem connected to version updates to macOS than OmniPlan itself. At $149.99, OmniPlan for Mac isn’t cheap but for those that demand MS Project support and a professional collaborative project management tool for Macs, it’s well worth the investment. Professional Project Management software doesn’t come cheap and you could easily spend a lot more than the price of OmniPlan and get a lot less back. OmniPlan doesn’t have a big learning curve either – within a few days, you should be able to more than master the basics and you’ll notice results within a few weeks of using it. Omni Group are also one of the better developers out there when it comes to customer support so you can buy with peace of mind that if you do get stuck or something goes wrong, you’ll be dealt with promptly (and by a real person not just a link to a help guide). You can get OmniPlan 3 from the Mac App Store and try a free trial for 2 weeks. Does OmniPlan allow scheduling of tasks with assisgning predecesing tasks to other tasks and including “floats” similar to MS Projects and other planning software? Yes although in OmniPlan it’s known as “slack” instead of “floats”. This can be displayed as columns in the Task View. You can check out the OmniPlan user manual here for more.